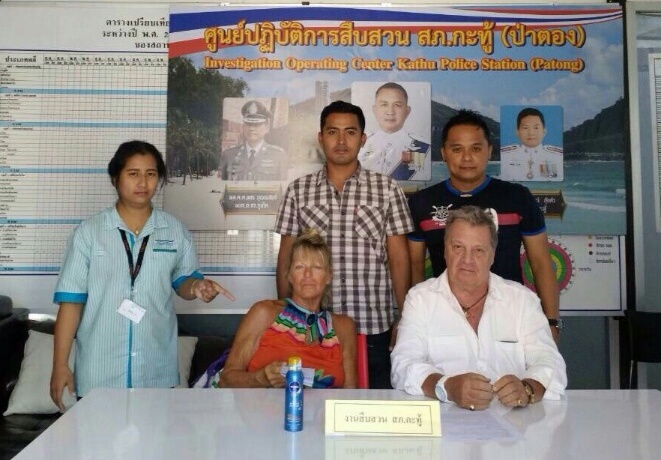 PHUKET: An elderly French woman was arrested and charged with theft in Patong this morning after she was found with a bottle of sun tan lotion belonging to a convenient store concealed in her hand bag. The suspect (in orange shirt) questioned by Patong police and a French translator. An ensuing search of the woman's handbag confirmed suspicions of the employees who fingered the suspect as evidence. Police seized the woman's white hand bag and the 200 militlitre "New Vision" bottle of sun tan lotion. Mrs Muriel has been charged with theft and is currently being held at Kathu Police Station where she can be deatined for up to 48 hours before before being sent to Phuket Provincial Court to be prosecuted. Kathu police are currently awaiting contact from the French Embassy. I'd be ashamed standing there pointing that finger. Ridiculous. Of course it's wrong to steal but this photo once more shows the mentality that the Thais have meanwhile. It's always the others. Never them.